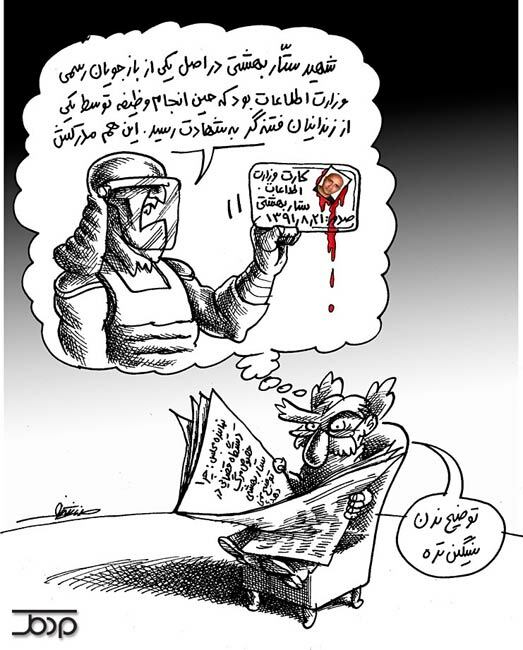 "Iranian Judiciary determined to deal with culprits in blogger's death"
"Following the firm orders from the head of the judiciary for a speedy probe into the case of Sattar Beheshti's death, three of the officials in charge of the prisoner's interrogation have been arrested and handed over to the armed forces court," the report indicates. In a statement issued on Monday, the human rights center of the Islamic Republic of Iran announced that the Judiciary is determined to quickly and firmly deal with the culprits in the death of Sattar Beheshti, an Iranian blogger who recently died in custody. The statement also said that by order of Judiciary Chief Ayatollah Sadeq Amoli Larijani, all dimensions of the case will be investigated and the results will be announced in the near future. Deputy Majlis Speaker announced on Sunday that a special committee had been established in the parliament to look into the case. "The Majlis National Security and Foreign Policy Committee has discussed the issue and has established a committee in this regard," Mohammad Hassan Aboutorabi-Fard told the Persian service of the Mehr News Agency. The committee was established after MP Ahmad Tavakkoli expressed his criticism of the fact that the judicial apparatus and the Foreign Ministry had maintained silence on the issue. In a speech during an open session of the Majlis on Sunday, Tavakkoli said that the judicial apparatus and the Foreign Ministry should provide explanations about the incident.